Day one of Banzai was a ton of fun. I was the Mad Hatter, Xerxes Break (Pandora Hearts) for the live Chess Game. This year I was a bishop piece and really didn't have much to say on stage. My pal, Colby, who played Pit from Kid Icarus was saying so many funny things I couldn't come up with any of my own. Part way through the game my brother and sister called saying they needed a confirmation sheet for registration. The lines for registration were very long this year and they had made to the end of pre-reg when they realized Sterling had no ID (his school doesn't let them take their ID's home because too many lose them). I am on stage for the game, expertly hiding the point that I am on the phone and told them to wait while I figure out what to do. The poor kids just got back in line but they were alright with it. My attack in the game came. My little brother, Bentley, was the Mad Hatter Chain so I summoned him on stage to take out the pawn we were facing. Soon after I was taken out by the enemy king piece and Bentley dragged me off stage. I think I heard a reference about being dragged to the Abyss... If you have seen or read the series you will get it. As soon as I was off-stage I ran out of the room, found my friend Dani (Who is awesome!) with her smart phone, and found the e-mail with Sterling's confirmation sheet. Crisis averted I darted back to the Chess game. This has to be my favorite part of day one. As I ran back into the room the judges were handing out the prizes for Best Death, Best Smack Talk, and Best Attack. Bentley was standing on stage (That kid has no stage fright I swear!) when they announced Best Attack to the Mad Hatter. My timing was awesome. Bentley started walking forward to get the award and I was bolting into the room and came up right next to him, pretending I had been there the whole time. All proud of his award. I know bringing kids to events like these can be challenging. You have to keep them entertained and even fed, right? I am really glad I brought my brothers and sister along this year. Bentley now has his own little trophy with "Best Attack" on it for chess. He really did great on stage in front of so many people. He is such a cool kid. The rest of the day was fairly normal. Just running around to see old faces and meet new ones. We went to the Dealer's room and looked at all the fun things there. I also took the boys to the game room, which became their favorite spot, especially with four player Pac-Man! My sister, Lexus, also got more a chance to run off and find her friends, rather than be attached to me so much. No one believes Lexus is an adult now! Not even me! 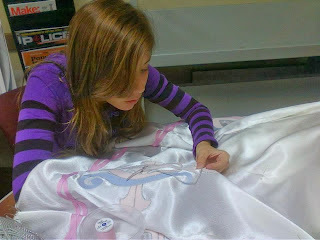 Lexus busily working on embroidery during the week before Banzai. Judging was stressful, but it always is for me. Especially in cases where I really care about the cosplay. I rambled badly, but I said all I wanted to in the five minutes they gave me. The worst part is I felt like I was pointing out all the bad things on the cosplay. I tried to counter with the parts that I thought were the coolest, like printing chainmail print fabric and how I attached everything together. Also, I was nervous about what they would think of the leather since it was my first leather craft armor project. After that, I could breathe easy. We all went to a Zelda meet up and took pictures. Bentley was dressed as Toon Link so we were stopped for pictures quite a bit. He is so cute with his plush Master Sword! Sterling was a Pokemon Trainer so we have some pictures of him fighting other cosplayers with his Pokemon. The Zelda shoot was a lot of fun. Finally the contest came around. There were so many great costumes this year. The walk-ons went as they usually do with all of them very unique. The skits were really well done this year too. I liked them all very much, especially the Persona-4 one! I have not played that game but the cosplayers did a great job of explaining their characters situation and acting out the parts. I took home 1st place Masters Craftsmanship! I can't believe it and I am glad all that hard work paid off! 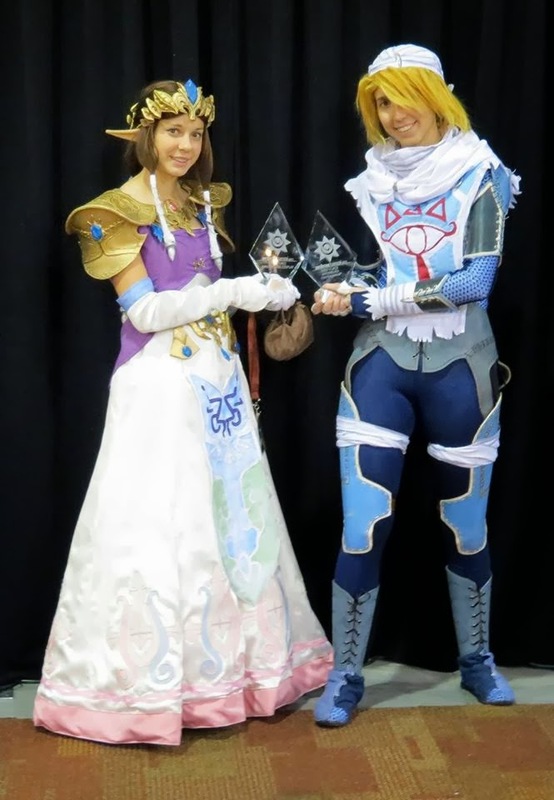 Then Lexus and I took home 1st place Masters Cosplay for our performance on stage! It was all so much fun! Many of my friends took home awards as well in each category. I would list them but I have listed them so many times now, haha! Sailor Crafty took Beginners. Renna Mira took Intermediate. J-ndrax took a Masters award and an Intermediate award. Colby also got a beginners award... so many talented friends! I am looking forward to challenging myself for next year. Yay Masters! .... but where do we go from here?